Review posted January 27, 2015. Candlewick Press, 2014. 38 pages. Ooo la la! This is a book for those who love the City of Lights. 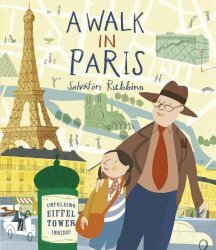 The story is simple: A little girl and her grandpa are walking around Paris, seeing the main sights. The pictures are hand-drawn colored sketches, but evoke the feeling of Paris. I was transported back in these pages. Extra facts about the things they see are printed among the pictures. The main narrative is a simple explanation of the day the girl is having with her grandpa. They go to a market, ride the metro, walk the streets, climb the tower of Notre Dame to look at the view, eat in a bistro, look at the Louvre, and stroll in the Tuileries, among other things. There’s a nice touch when they come out of the Metro and see the Eiffel Tower all lit up and sparkling – there’s a fold-out page which gives the reader a feeling for how spectacular and big the tower is.